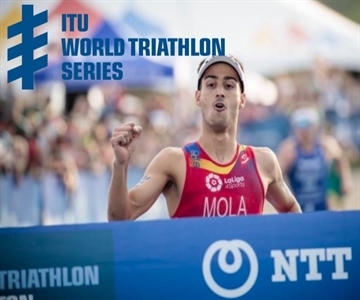 Spain’s Mario Mola stands on the cusp of a remarkable double-triple for Spanish triathlon as he chases a feat only previously achieved by compatriot Javier Gomez in 2015: a straight hat-trick of ITU World Championship titles. Wins in 2016 and 2017 already sealed Mola’s place in the pantheon of the sport’s greats, but victory in the 2018 ITU Grand Final would cap an incredible few years on the front line of triathlon. Finishing anywhere in the top 14 on Sunday afternoon in Australia’s beautiful Gold Coast will guarantee the 28-year-old his third world title in as many years, and it is a familiar circuit on which he has secured the gold in both of his last two attempts. The Olympic-distance course takes in two laps of the calm inlet waters off Mitchell Park before the athletes head out on to a tight, flat 8-lap bike circuit and rounding off the race with four laps on foot for what looks certain to be a tight battle for the final WTS medals of 2018. Hot on Mola’s heels will be home favourite Jacob Birtwhistle, a man who has mastered the art of the sprint over the final kilometres in recent outings and one of the few that can match the Spaniard’s sheer pace on foot. A finish outside of the top six would leave the World title out of his grasp, so the Australian is sure to deliver an explosive display in a bid to pile the pressure on his rivals and give himself the best possible chance. Likewise Vincent Luis, who topped the podium at the 2017 Grand Final in Rotterdam and still has a mathematical chance of taking the title. Six top ten finishes, including three podiums, underlines his consistency so far this campaign, and after missing out in Montreal he will be fresh for the Gold Coast challenge. Two South Africans will undoubtedly be challenging for the medals, Richard Murray’s victory in Leeds and third place in Hamburg proving his highlights so far in an unpredictable year, while Henri Schoeman flew out of the blocks with gold in WTS Abu Dhabi and the Commonwealth Games before losing some of that rhythm after a solid eighth in Bermuda. Norway’s powerful Kristian Blummenfelt has continued his excellent form from the end of 2017 with three WTS silvers this year and would love to finally land a first WTS gold medal on Sunday, and after a busy 2018, Canada’s Tyler Mislawchuk would love to find himself on the World Series podium for the first time. Elsewhere on the start line, Great Britain’s Brownlee brothers race together at the top level for the first time this year. Alistair Brownlee has been restricted to appearances at the Commonwealth Games and European Championships so far this campaign, while Jonathan has had a difficult season getting back to his sparkling best, coming off his bike while well-placed in Abu Dhabi and never quite recreating his full flow.